We are living in a new economy— powered by technology, fueled by information, and driven by knowledge. Education is the only key to avail ourselves of a plethora of opportunities which our 21st century, better known as the “century of knowledge”, can offer us. To be industry ready today, student learning must surpass mastery of core subjects and embrace 21st century knowledge and skills like critical thinking, communication, collaboration, and technology literacy. It goes without saying that teachers, principals, academicians have a significant role to play in achieving the visions for our 21st century children. With a view to taking school education to the next level by strengthening leadership skills among school leaders, digitalLEARNING, a premier education magazine of Elets Technomedia Pvt. 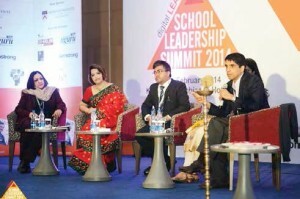 Ltd. organized the School Leadership Summit 2014 on February 8th at the Kempinski Ambience Hotel. The SLS 2014 also recognised teachers and principals who are the key catalysts for change in a student’s life at an early stage. A compelling one-day agenda was built around the core theme of issues affecting the current school education system in India. The summit witnessed a galaxy of top principals, academicians and visionaries in the field of education. The summit commenced with several thought leaders raising important issues affecting the current school education system in India. The speakers set the tone of the summit with thought-evoking discussion on pedagogy, enhancing the teaching-learning process, use of Information and Communication Technology (ICT) in schools, infrastructure and need for teachers’ training among other important issues. The school leaders also got a chance to interact with professor Dr Aruna Broota, clinical psychologist and Dr Jitendra Nagpal, Director, Expressions India – the National Life Skills, Value Education and School Wellness Program. The summit was divided into six sessions on some very pertinent themes such as Thought Leaders’ Panel, School Well Being: Changing Times and Challenges (workshop by Dr. Jitendra Nagpal, Program Director “Expressions India”- Instt. of Child Development & Adolescent Wellbeing, Moolchand Medcity), Nurturing School Leaders of Tomorrow, Role of Technology in Creating Excellence in School Education, Life Skill Education Emerging Landscape (exclusive Life Skills workshop on Mentoring e-kids by professor Dr Aruna Broota, Clinical Psychologist), and Building Visionary Schools in Globalised World. thought leaders’ panel The panel session on “School Education: Is not innovating an option?” had speakers like Snehal Pinto, Director, Ryan Group of Institutions; Vandana Lulla, Director, Podar International School; Anshul Arora, CEO, Edvance Group; Poonam Singh Jamwal, CMO, Extramarks Education Pvt Ltd; and was moderated by Amol Arora, Managing Director, Shemford and Shemrock Schools. The discussion started on the note- “Is innovation in education important?” Vandana Lulla, Director, Podar International School, started off the discussion by asking whether schools could survive without innovation. In her address she reiterated in Bill Gates’ words, “The economy of a country drives with innovation.” With her innovative thoughts she kickstarted the discussion. While talking about innovation in education, she said, “Innovation in education is not one person’s responsibility; it’s the responsibility of everyone.” She asserted that a teacher should be the mentor and the felicitator for a child. The mindset of the teachers should be changed to bring in innovation. She pleaded, “Be the change you want to see.” Furthering the discussion, Anshul Arora said that innovation is not about fancy technologies, innovation is thinking about a new paradigm of thoughts. “Innovation in pedagogy is thinking about how you create thinkers who can think critically, collaborate effectively, communicate well, have character and values, and work across cultures. These are the fundamental elements that we need to think about in pedagogy”, he added.